In celebration of our talented entertainers. In celebration of 8 1/2 years. Dr. Tom Vinick has brought on a partner in his practice of music making! Dr. Wes Smith will be joining Tom on stage this Friday night at The City Wine Sellar. Together, they are known as Pairadocs (Get it? Pair of Docs?) and will diagnose and cure your musical malodies with melodies and pop tunes from the 40s through today. Versatile, talented, and always full of energy, these two doctors of entertainment will be "in" from 7-10 pm. 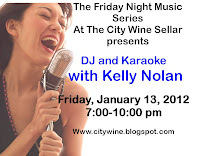 Have dinner and a glass of wine and a musicalicious night at City Wine. 252-335-1163. Music 7-10 pm; Deli fare served till 9 pm. Call 335-1163 for more information. This band is something else! In a super-great way, of course. 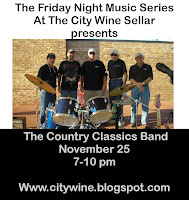 A band formed out of an appreciation for "Classic Country" music that was mostly recorded in the late 50's and 60's, The Country Classics band plays music from artists such as Hank Williams Sr., Merl Haggard, Elvis Presley and others from this era. Hee Haw! John Anderson (guitar), Mercer Long (guitar), Jerry Long (drums), Steve Ackley (Mandolin and vocals, Dickey Ferrell (pedal Steel guitar), Wayne Sanders (fiddle, banjo), Mike Albertson (Bass, guitar). Cowboy boots and hats aren't required, but sure do help add to the authenticity of the evening. Music from 7-10, Deli fare served until 9 pm. Call 252-335-1163 for more information. On this first Friday the 13th of the year 2012, join us in The Sellar Wine Bar at City Wine Sellar for a fun night of music, singing, laughing, and visiting! Make it a lucky Friday the 13th. 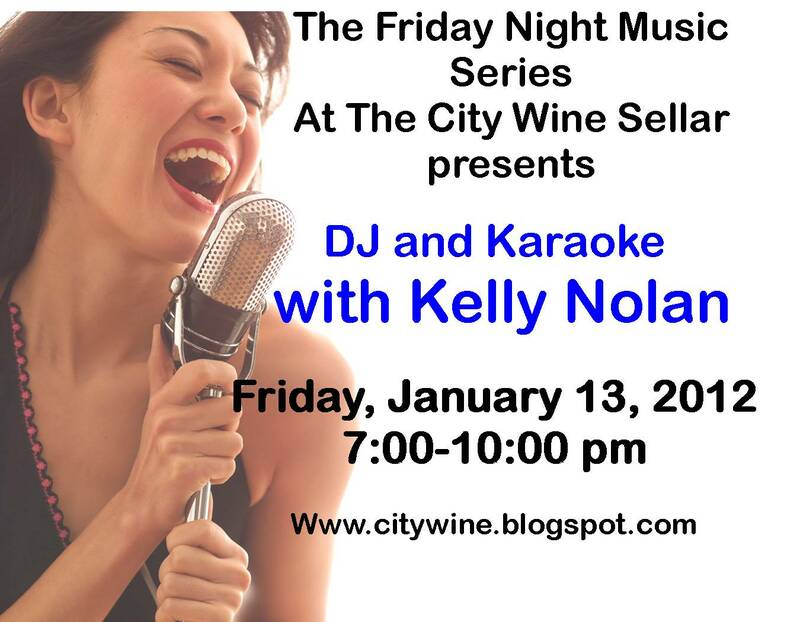 Kelly Nolan will be keeping the gig lively with a fun filled night of singing and fun at the City Wine Sellar for Karaoke by Kelly. Bring a friend; everyone knows karaoke is more fun with a friend to egg you on and cheer you on. Entertainment 7-10 pm; Deli fare served till 9 pm. No Cover. Call 252-335-1163 for more information. 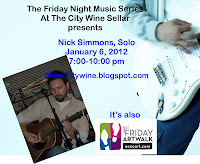 Enjoy the amazing talent of Nick Simmons, who will be playing in solo acoustic mode, Friday night, January 6, at City Wine Sellar. Nick is a natural musician. When he plays, you can just FEEL his love for music. As a solo entertainer, Nick tones down the "distortion and the volume and lets the music speak for itself." And it does. It truly does. Nick is a truly talented singer, songwriter, and musician. 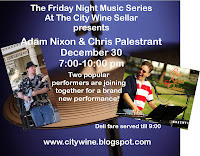 I am proud to know him personally and love having him perform at City Wine Sellar. 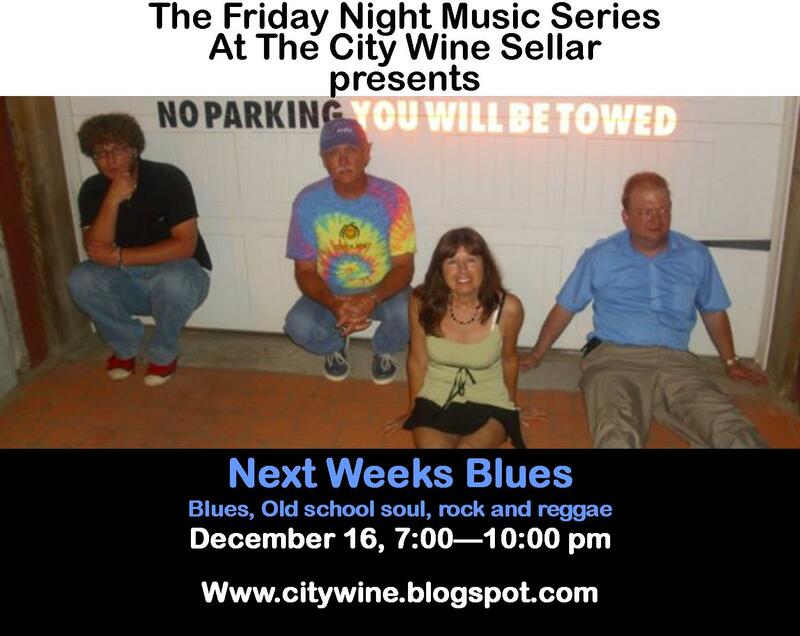 Music from 7-10 pm; Deli fare served till 9 pm. Call 252-335-1163 for more info. 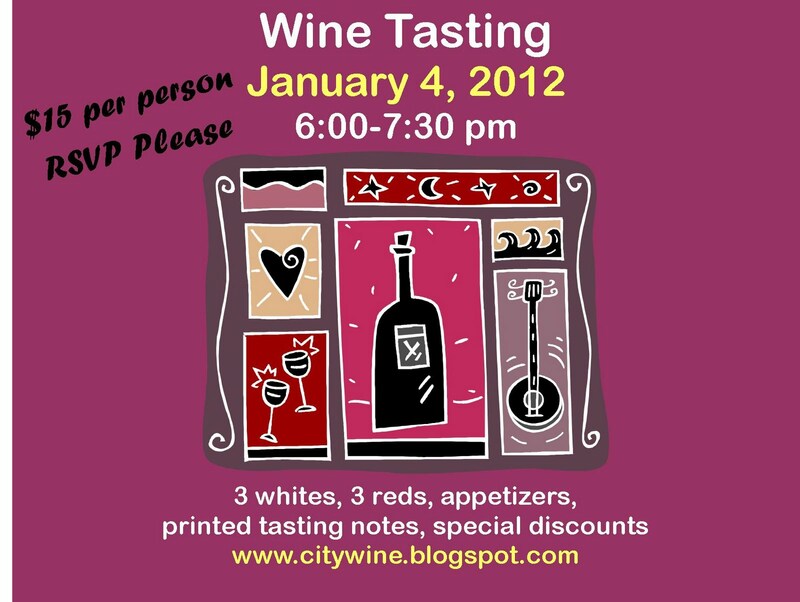 It's wine tasting time! 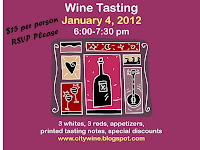 Every first Wednesday of each month we gather at City Wine and sample a few wines, nosh on a little food, gab with old friends, make new friends, and just have a responsibly fun time. Join us, won't you? You don't have to know a lot about wine. In fact, you don't have to know anything about wine. 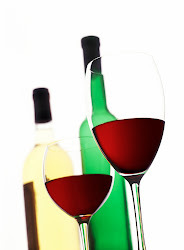 We sample a selection of 3 whites and 3 reds, and provide you with printed tasting notes. 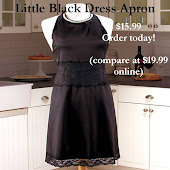 There's no pressure to buy anything. Just come and enjoy. If you are familiar with the band Uphill, you'll certainly recognize the names Adam Nixon and Chris Palestrant, two of its talented bandmembers. 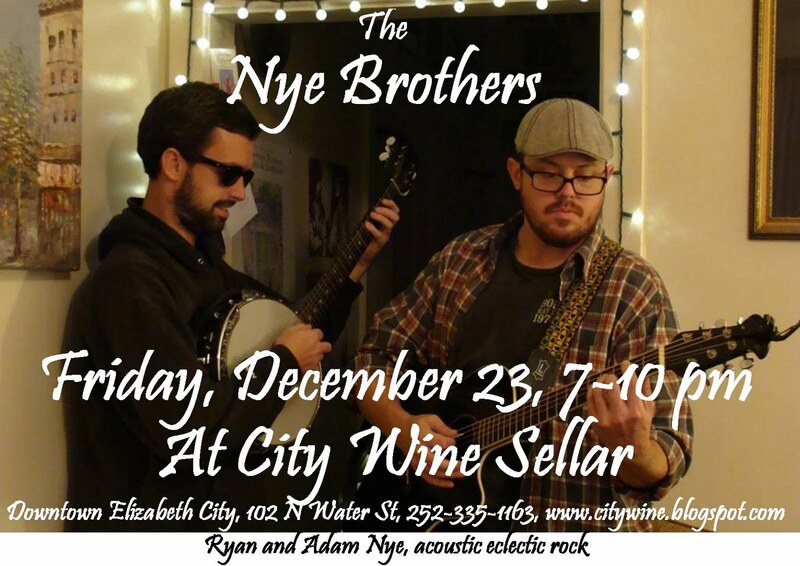 They have each performed separately here at City Wine Sellar before, but now, for the first time ever, they will perform as a duo named "Deacon and Catdaddy of Uphill." Come for a few of your favorite songs from each of their solo acts, a bunch of new music, and even a few Uphill hits -- all with vocal harmonies and brand new arrangements. 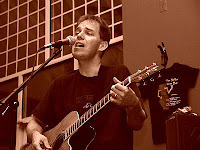 So, if you enjoy the folksy-blues counry eclectic mix of Deacon Blues and if you enjoy the rare, kickin' and classics of Chris Palestrant, you'll be in for a treat with the combination of these two quality acts. Deacon and Catdaddy will perform from 7-10 pm as part of the City Wine Friday night music series. 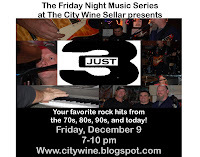 They will also play from 5-7 on the same evening during the Bill Luton for NC House fundraising event. Stop by early and meet Bill, listen to music, and visit. 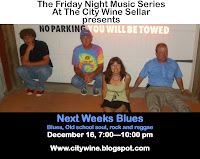 Next Weeks Blues will be the band of the evening on Friday night. They play a mixture of Blues, Old School Soul, Reggae, and Rock. Their influences range from Etta James to Robert Johnson to the Three Kings (Freddie, Albert, and B.B.). At the helm is singer, Linda Farley accented by the lead licks of guitarist, Dennis Lighthart. And it’s all bound together by the rhythm section, bassist, Michael Huffman and drummer, Tom Williams. Come on out to enjoy them in the Sellar Wine Bar. 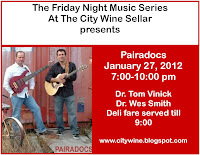 Music from 7-10 pm; Deli fare served till 9 pm. Call 252-335-1163 for more info. 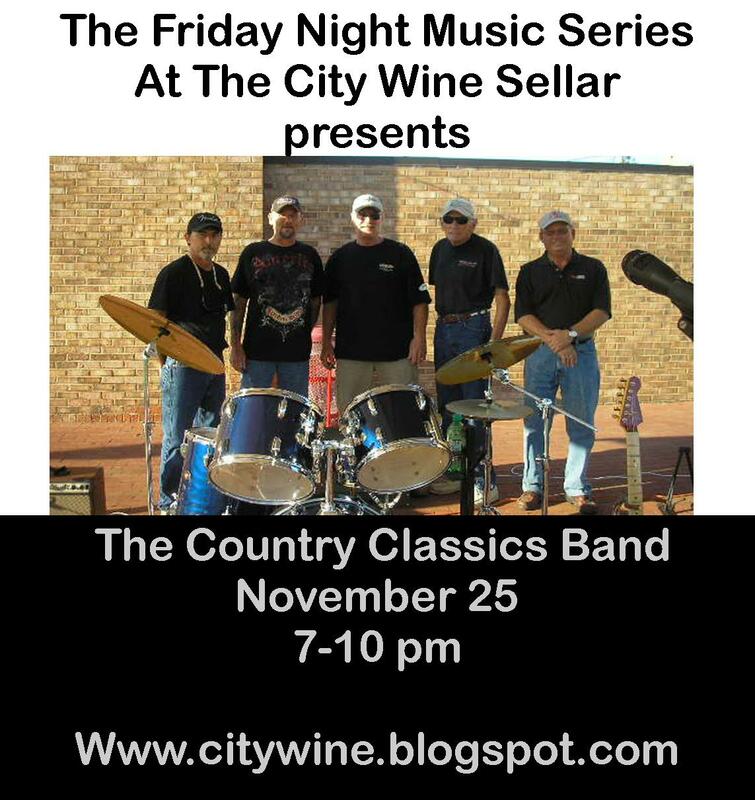 A band formed out of an appreciation for "Classic Country" music that was mostly recorded in the late 50's and 60's, The Country Classics band plays music from artists such as Hank Williams Sr., Merl Haggard, Elvis Presley and others from this era. Hee Haw! John Anderson (guitar), Mercer Long (guitar), Jerry Long (drums), Steve Ackley (Mandolin and vocals, Dickey Ferrell (pedal Steel guitar), Wayne Sanders (fiddle, banjo), Mike Albertson (Bass, guitar). 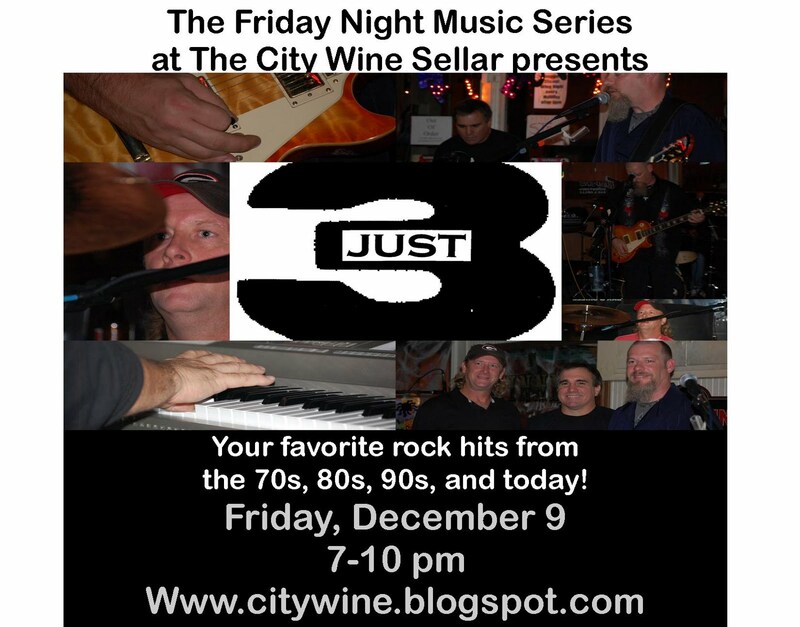 Music from 7-10, Deli fare served until 9 pm. Call 252-335-1163 for more information. 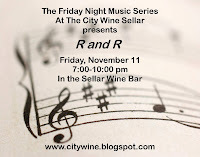 R&R is a two- to three-piece band that is primarily guitar and bass oriented, with some use of keyboards. With the use of drum machines for percussion and a vocalizer for two- and three-part vocals, they play a wide spectrum of music spanning several decades in the classic rock and classic country genre. They're brand new at City Wine Sellar, so please come out, check them out, and welcome them to downtown! 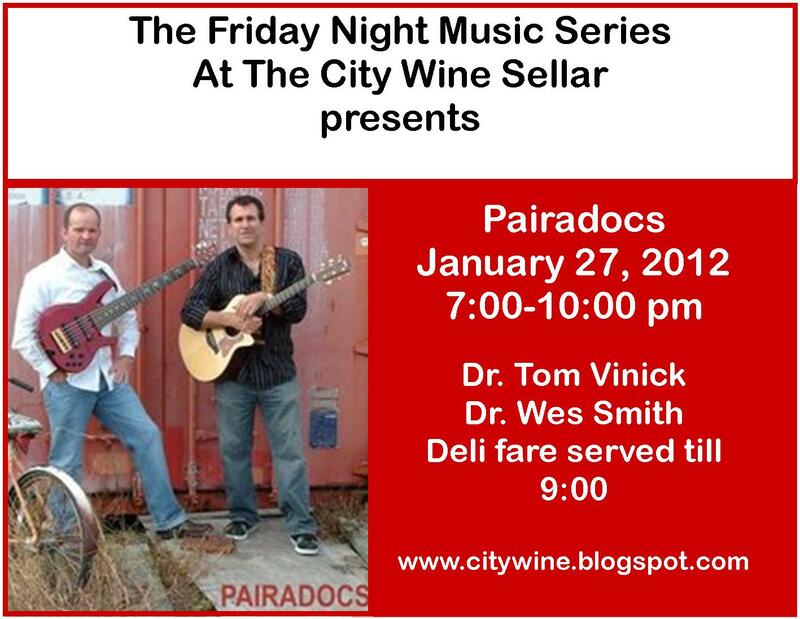 Music from 7-10; Deli fare served until 9 pm. Stop by for your favorite sandwich on Sundays from 11 am until 3 pm. 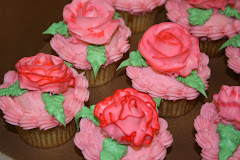 Order for parties or just for fun! Long & Short Sleeve; New, cool design! Great Wi-fi signal for connecting to the internet anywhere in the business or outside in the cafe seating area.